Hi guys! Hope you’re hungry because I have a recipe that’s the bomb and you are totally going to love it. 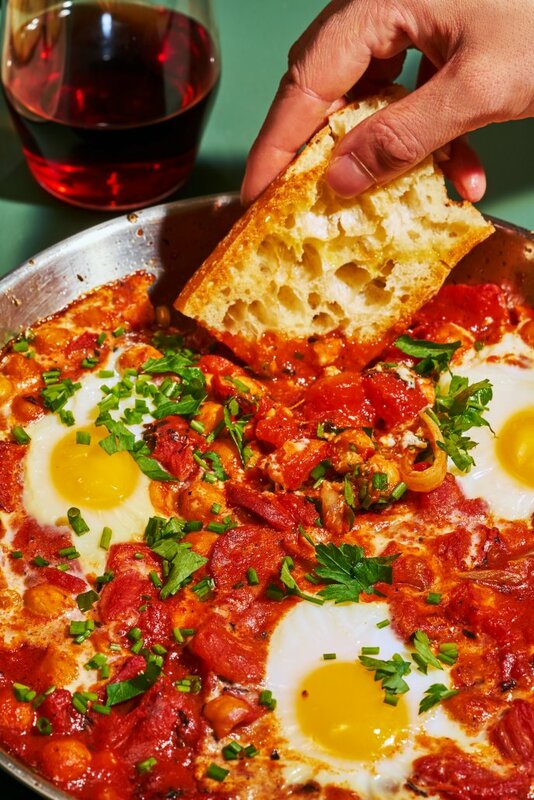 This recipe is to make shakshuka — the Middle Eastern / North African spicy poached egg dish that’s pretty popular on the internet right now. This dish has come back to the spotlight due to its popularity in brunch spots, but, you can have it for dinner too, especially when you need a little bit of comfort food to pamper you. The base of this dish is fire roasted tomatoes, to which I added some chorizo and chickpeas, then mixed in aleppo peppers to increase the heat. You top that with poached eggs and cook the whole thing in the oven. Once it’s ready, you garnish it with chives and parsley. Super easy and absolutely delicious! Obviously, you need an extra carb in there, so I added crusty rustic bread to dip. 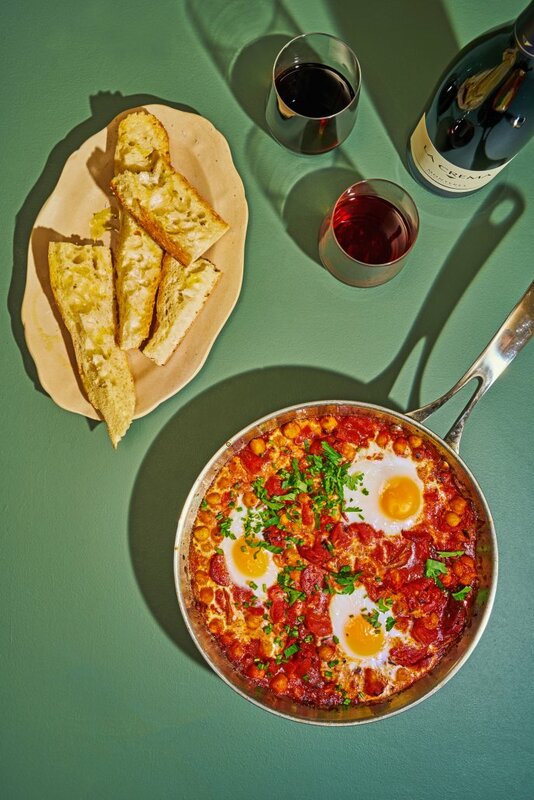 Since the shakshuka is spicy and comforting, I thought of pairing it with something that’s somewhat mellow, easy to drink, but can match the spice in the dish. 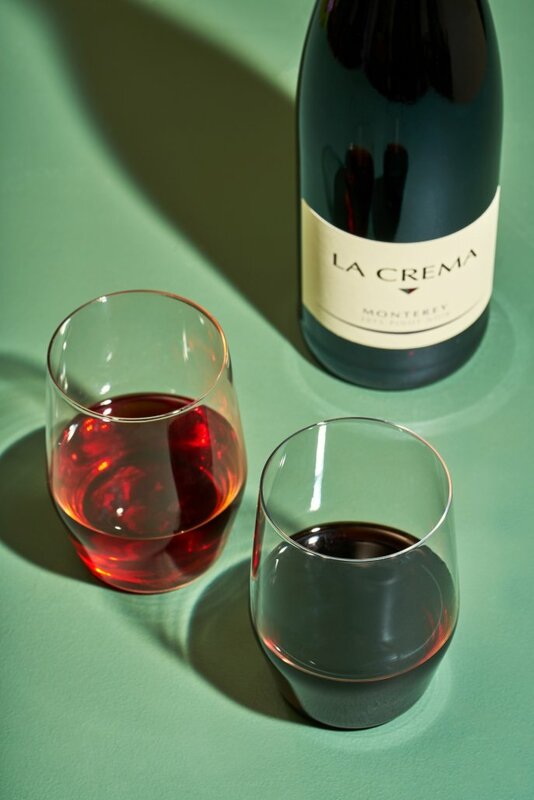 My choice for this is La Crema’s Monterey Pinot Noir — it has pleasant acidity, some nice fruity notes and a balanced oak backbone to round out the palate. 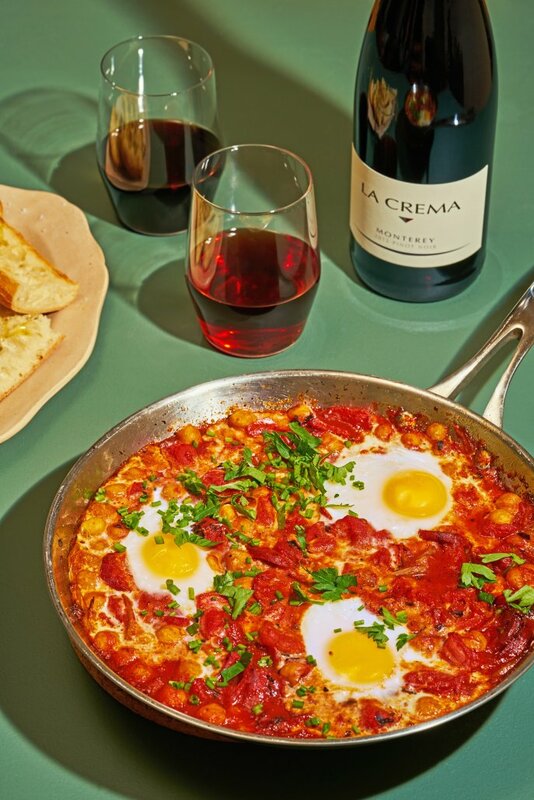 All together with the tomatoes, eggs, and spices, this is the winning pairing you need for a weeknight meal. Oh, and if you want to make the shakshuka even more hearty, you could add some collard greens or kale, or also top it with some grated parmesan. Place a large oven-proof saucepan over medium heat, add a splash of olive oil, then sauté the onion, garlic, and chorizo until the chorizo starts to render a bit of fat. Cook until onions are translucent (about 6 minutes), then add the chickpeas, paprika, and all other spices. Continue to saute for another 4-5 minutes until fragrant. Add the fire roasted tomatoes, toss and season with salt and pepper. Make a little nest with a spoon over the tomatoes and crack the eggs on top, season with additional salt and pepper then bake in the oven for 20-25 minutes until eggs set. Remove from the oven and garnish with chives and parsley. Serve hot with a slice of toasted rustic bread or baguette.